For a long time now, the exercise of Teacher Education, there has been and still is a marked shortage of the supply of relevant text books in many areas which deal with the preparation and production of history teachers. It is in pursuit for the satisfaction of the supply in this area which makes the advent of this book a very welcome issue in Kenya’s and international academic fields. 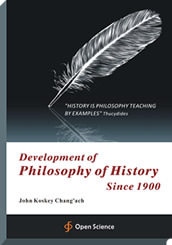 Hence, the arrival of this book “Development of Philosophy of History Since 1900” makes a great academic and professional contribution in this area. The contents of the book, as well as the order of presentation are derived from the stock of knowledge and experience inherent in the courses of the Department of History, Political Science and Public Administration; which by nature of its position in education is a base factor for creation and development of effective standards and professionalism in history teachers. The book is the first of its kind with sample questions in each chapter and for setting out and establishing a systematic study in the field of progressive changes which take place in human societies throughout human history with regard to developmental changes in history throughout all generations. Since it is a detailed study of progress of history, from the 1900 to present, this book becomes a must material for studies in history, teachers of history, history students and educational professionals. Therefore, the book is appropriate for every form of academic pursuit. Revision questions have been included in each chapter and at the end of the book to help the history student evaluate his/her understanding of all the topics in the course. The questions will also come in handy while revising for end of semester examinations. A the end of the book, a bibliography is provided to enable the students of history and their lecturers to make reference and undertake further research to enrich their knowledge. 1.4 What is the Concern of the Historian? 2.3 What Steps Does an Historian Take When They Set Out to Elucidate an Historical Event or Set of Events? 3.7 Historical Causation: Why is it Problematic? 6.4 Why is Historical Objectivity Problematic? 6.5 What is the Problem Then? 6.7 Can History be Objective? Senior Lecturer, Head of Educational Foundations Department, School of Education, Moi University. His career spans both history and history of education. He has published many articles in refereed journals in both history and history of education, among which are several devoted to exploring and articulating issues that affect society. He is author of several books in the same field of study. Students in Diploma colleges taking history as a subject, undergraduate and postgraduate students in the universities pursuing studies in history. In Kenya all universities offer the course. It will be course book for lecturers in all the categories.